Earlier this week, Apple announced the iPhone XS and iPhone XS Max. Because the new iPhones will hit stores in less than a week, many potential customers may be trying to decide which case, phone color and storage capacity to buy. There are a lot of iPhone XS cases to choose from, and many more will become available over time. The upside to having so many options is that most people’s iPhones will be uniquely their own. The downside is that knowing where to begin when looking for the right case poses an even greater challenge. Of course, most iPhone cases serve the same basic function: to protect the iPhone from dings and scratches. So, choosing the “right” case is ultimately up to the customer. The style and design of the case has to appeal to them. For some of us, our iPhones, for one reason or another, are particularly prone to being dropped, crushed or spilled on. Fortunately, there are a few cases that are built with durability in mind. Two popular case brands that value protection over all else are OtterBox and LifeProof. Apple makes a few cases of their own for the new iPhones. One option from Apple is the basic silicone case, which covers the back and sides of the iPhone. The silicone case comes in a myriad of unique colors, including Nectarine, Lavender Gray, Blue Horizon, Stone, Pink Sand, Midnight Blue, White, Black and (Product) Red. Apple also offers a more “executive” style case, which also covers the back and sides of the iPhone, but is made of European leather. This case is available in Peony Pink, Cape Cod Blue, Forest Green, Taupe, Midnight Blue, Saddle Brown, Black and (Product) Red color options. An easy way to browse through iPhone case options is to visit a local electronics store, such as Best Buy or your local Apple Retail Store, where the case selection will be expansive, but perhaps not as daunting as browsing across webpage after webpage. It is also worthy to note that Apple’s new iPhones are the most durable and water resistant yet. The iPhone XS and iPhone XS Max have been upgraded to an IP68 water and dust resistance rating. As for water resistance, these new iPhones can be submerged in water as deep as two meters for as long as 30 minutes without damage. The IP6x is also the highest dust resistance rating out there, so dust and dirt are no match for these phones. Cases can be bought and replaced without too much fuss. However, the color of the iPhone itself is pretty much permanent. Apple’s iPhone XS and iPhone XS Max come in more color variations than last year’s iPhone X. In addition to Silver and Space Gray, this year’s iPhones are also available in the popular Gold option. While, once again, the color is ultimately the choice of the consumer, there are a few factors to keep in mind when making a decision. Unlike with many iPhones in the past, including the iPhone 8 and iPhone 8 Plus, the color of the back of the iPhone no longer plays any determining factor in the color of the front of the iPhone. It used to be the case that Silver iPhones had a white front and Space Gray iPhones had a black front. However, the iPhone XS and iPhone XS Max feature a nearly edge-to-edge display, so Apple has opted to make what little color is visible on the front of the phone simply black. There used to be a tradeoff between the Silver and Space Gray variations. The metal of the Space Gray was slightly less prone to visible scratches, but its black front made smudges more visible around the screen. Now, the front of the new iPhones is almost entirely screen, so any smudging that occurs will be on the screen only. As for scratches, the iPhone XS and iPhone XS Max are made out of a highly durable glass rather than metal, and are actually much more scratch-resistant. Gold iPhones have a tendency to stand out in a crowd more than the other two options. A gold iPhone is unmistakably an iPhone, and this can create the potential of making them even more theft-prone. On the other hand, some people are very proud of their Apple devices and want them to be, as much as possible, a reflection of their personal style. 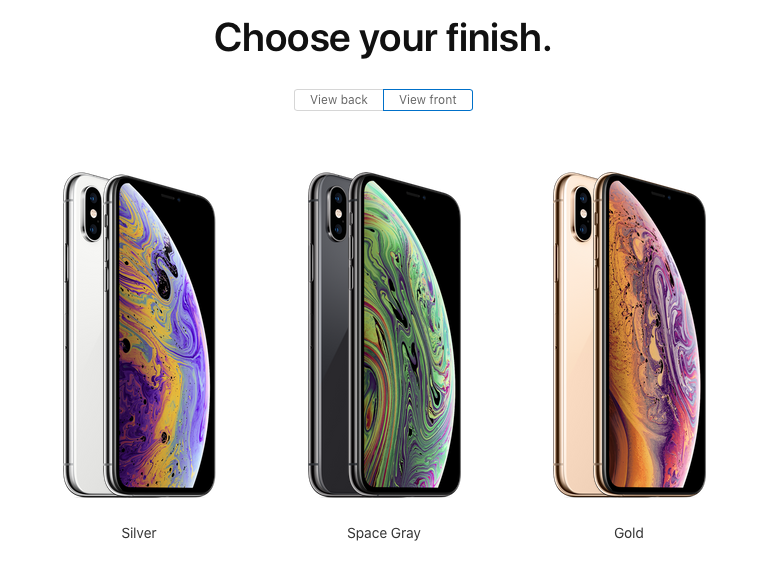 A step up from last year’s iPhone X, the iPhone XS and iPhone XS Max allow customers to choose from 512GB models, priced at $1,349 and $1,449, respectively. This is a significant upgrade from the previous 256GB high-end model of the iPhone X. These new high-end phones do, however, set themselves apart as the most expensive consumer smartphones yet. The smallest storage capacity option for the iPhone XS and iPhone XS Max is 64GB, priced at $999 and $1,099, respectively. However, Apple does not offer a 128GB option, which means the upgrade to the mid-range 256GB models of the new iPhones is only an additional $150 when bought at full price. Fortunately, in a world of cloud storage and music steaming, a lot of personal media, especially photos, won’t have to take up extra space on the iPhone’s hard drive. Therefore, for some users, a more expensive iPhone with more storage may not be necessary. This week, Apple also announced the mid-range iPhone XR, starting at $749. Preorders for this third new iPhone are still a month out. Stay tuned for updates as we get closer to launch day. Questions or comments regarding the iPhone 6, iPhone 6 Plus, or how to choose the right case, color or hard drive capacity? Leave them down below!